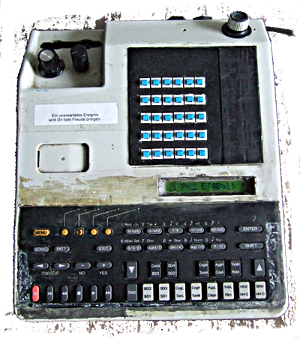 The Yamaha QY10 mini sequencer was the first instrument I rehoused into a phone. The original shell was too small to accommodate all my switches. Alas, the story of the Qyphone is a rather sad one. It was one of my most important instruments until some very bad person stole it. Out of the room that used to be my bedroom.When I moved out, I left it in a bag there and told some housemates to take care of it until I come back to pick it up, only to find all my stuff in other peoples' hands when I came back. So yeah, thanks Marie and Michael, who needs enemies when he's got you guys as friends? It always makes me wonder how stupid one must be to steal something that is very obviously a personal item up to the point of being completely useless to anyone else. I find it quite hard to believe that anyone capable of such behavior would actually be able to figure out how it works and bring it to any kind of good use. "An unexpected event will soon bring you joy." The fact that it was one of the most 'chaotic' bends I've made just adds the icing on the cake. Nothing was mapped out, every switch just connected to some random pin on the main sound chip. I used to have sounds that were created by up to half of the switches being pushed simultaneously. I wouldn't have the faintest idea how to ever recreate this if I were to do it again. If you, dear reader, happen to see this exact instrument in someone's unworthy hands, please consider kicking that idiot right in the face for me. I try my best to be a forgiving person, but some things I find very hard to tolerate. Ah, and it was so great. The QY10 is already capable of being a surprisingly funky beast on its own. And then with the bends, every sequence you built on it as well as those cheesy presets could instantly be exploded into the most unpredictable mess of broken rythms, noise swooshes and heavy bass you could imangine. 30 switches that produced the craziest rythmic variations and some of the most demented melodic elements I've heard in my life. A wonderful tool for improvising breakcore-ish madness. I also built in a LTC1799 pitch bender, which made it even more limitless. I guess at some point I'll try to build another one. Until then, I'll have to deal with the fact that I trusted the wrong people. Of course, there's next to no recordings of it.